The public is being asked to help with a search for Ruby Barnes this Sunday, Oct 21. The command Center will be the Whitebear casino parking lot and people can sign in between 9:30-10:30 am. If they are interested in volunteering, they can text Marla @ 306-577-1853. It has now been more than three months since Ruby Barnes went missing from her home at White Bear Lake. 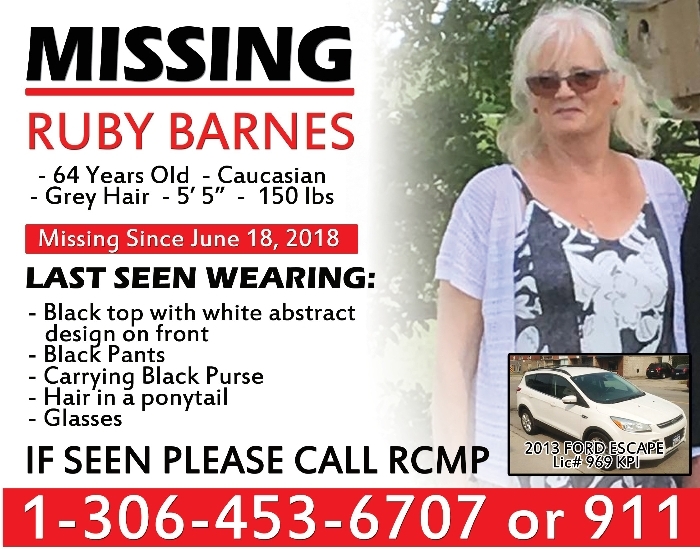 The Carlyle RCMP is continuing its investigation into the disappearance of Ruby Barnes, as the three-month anniversary of her disappearance approaches. Barnes was last seen at a business in the 200-block of Main Street in Carlyle at approximately 9:30 a.m. on June 18. Receipts from her time in Carlyle were found on the counter at her home at White Bear Lake. Barnes was reported missing to the RCMP later that day. Staff Sgt. Darren Simons with the Carlyle RCMP said there was an extensive search last week in the area where her cell phone was last pinged. RCMP and civilian searchers from the Broadview, Esterhazy and Carlyle detachments searched in the Round Lake area north of Whitewood for a full day, but did not find anything relevant to her file. The RCMP continues to receive calls about her disappearance. There is a lot of interest regarding her case, particularly from her family and friends, and the RCMP continues to follow up on any information they receive. The number of tips has slowed down. “When we get tips, we liaise with our specialized sections, we liaise with member detachments, so there’s something always happening,” said Simons. Any tips are followed up immediately. The Carlyle RCMP usually dedicates time to the file at least once per day. Barnes, 64, is described as Caucasian, standing five-foot-eight and weighing 135 pounds. She has grey hair. When she was last seen, Barnes was wearing black pants and a black top with a white abstract design on the front. She was carrying a black purse, had her hair in a ponytail and was wearing glasses. Has there been any updates on your mother? There hasn’t been any updates, they don’t know anything at this point still. The police were out and did a search last week. Where have the police been searching? Last week they did Round Lake and Crooked Lake, all in there. They went door to door and knocked on people’s doors and they also did around the edges of the lake and don’t believe there is anywhere where mom could have went in. Our family is going to do a search of the valleys again, but we just want to wait until the leaves fall off the trees and we’ll do it again. 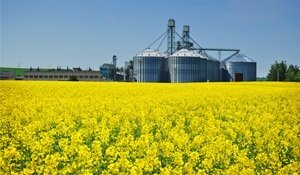 Why is all the focus on the Qu’Appelle Valley? Are you quite sure that is where she could be? We don’t really know, but just because of the phone ping coming off the Broadview tower. We just know that she would have followed the number nine highway if she was going north. How tough is it to go this long with not knowing what happened? It is really hard on all of us and you just don’t know what to do anymore. It’s pretty frustrating some days as well. If people want to help is there anything that they can do? Can they volunteer to help with the search of the valley or anything? Yes I think we’re going to ask people to help us search the valley when it comes time. There is a lady at Manitoba Search and Rescue that has contacted me and said she’ll help set it all up. We are going to have a meeting next week. Are you getting a lot of support from people—offers to help or just moral support? Yes lots of people have reached out to us to help and just send us messages all the time, stop for coffee make sure we’re doing okay. It’s really nice. Everybody has just been really nice to us and been wanting to help us in some way. We’ve had quite a few people offer and come out and help already, so that’s nice. How big of an area will you be searching? We would search north from the Kenosee area to Stockholm. There are a few places in the Kenosee area where there are deeper drop offs. We went out and looked but you just don’t know if you’re missing something. So we’ll do all the valleys and any drop offs from where my parents live to the Kenosee area all the way up to Stockholm, like in the Qu’Appelle Valley, past those is what our focus is going to be on the next search too. It’s been searched a few times over but we just thought we will wait until the leaves fall off and we’ll do it again and that way it will be peace of mind for us as well that we didn’t miss something. Have there been any leads? Nothing. No sightings, she hasn’t used her bank cards, her phone hasn’t been turned back on, nothing. Her car hasn’t been spotted. That just seems unbelievable. Anyone with information regarding Barnes’ whereabouts is asked to call Carlyle RCMP at 306-453-6707, their local police service, or Crime Stoppers at 1-800-222-TIPS (8477).